There are certain men's fragrances that I classify as "goof proof": easy-going, accessible scents that don't require an elaborate context or personal manifesto every time you spray some on. They enhance day or night, work or play, and they quietly go about their business of making you smell good, subtlely. Fitting the goof-proof bill are Guerlain Vetiver, Hilde Soliani Bell'Antonio, Roger & Gallet Bois d'Orange, Gendarme, Geo. F. Trumper Wild Fern, and that triumph of style over content, Escentric Molecules Molecule 01. 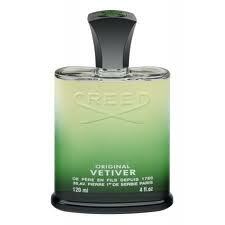 I discovered the no muss, no fuss attraction of Creed Original Vetiver the good old-fashioned way: by smelling it unexpectedly on another person. at the first 20 minutes of the stuff while it dawdled in the well-traveled terrain of lemony laundry freshness. But like a roadtrip where the tedious stop-and-go of traffic lights and Walmarts eventually give way to big skies and wide horizons, Original Vetiver finally motors out of the suburbs and gets you to where the ahhhh-h-h-h is. This sounds like something I might like! Did you just do an excellent job in describing it? yes, you did! I also like your look - did you do something with your hair? (I hear Audrey Hepburn, as Eliza Doolittle, trilling "Lov-er-ly" in my head!) Love the dress. Thanks, Jo - just a refresher trim did the trick for the follicles. I hereby also nominate Azzaro Pour Homme for the "goof-proof" category. At first, when I smelled it, I was under-whelmed. My husband turned up his nose and said, "This smells like English Leather." It does not. It has stolen my heart and I wear it every day. Oo, and yes, Katie, you mentioned that you loved Arpege. I procured a little sample at my farmers' market, of all places. J'adore! This makes me feel like Thomas Haydn Church's character in Sideways, when he's hitting on the lady at the winery and pretending that he knows anything about wine. *slams a glass* "Tastes good to me!" over and over again. That's really at the heart of enjoying anything in life, I think! Great review of Creed O.V, Katie, and yes, you do always look lov-er-ly! Do you, by chance, notice any similarity between Creed O.V. and Givenchy Monsieur de Givenchy? Maybe not the specific notes, but the fresh, clean, good smelling vibe? Or is it just my under-sensitive nose? Next time I'm at Harrods, I'm going to stage a dance-off between M de Givenchy and OV and see if I can buy what you're s(m)elling. Oh man! If'n we're back, as you say here Pooka, in "Goof Proof" territory for men's fragrances I hereby most enthusiastically vote for Parfum di Nicolai's New York. Because in the swollen sea of "fresh, non-offensive" but great-smelling scent, New York is the relaxed couple holding hands on the beach and nuzzling each other while staring out at that sea. I haven't forgotten it in the two years since my first sample from luckyscent.com. And no horses were frightened during the making of this post. I smelled "New York," and thought, "What's the big deal?" but knowing how I loved Azzaro Pour Homme once I gave it a chance makes me want to try it again, too. If you like those APH and are thinking of giving New York another chance (issues re reformulation aside), my other recommendation for you to try is Fahrenheit 32 if you haven't already, which also falls into the affable territory of 'masculines". Nora - the big deal on New York for me only arrived after I'd smelled all the laundry freshener on sale during my stint as a Macy's Men's Fragrances employee years ago. I tried it out based on a huge rec from Luca Turin, and was prepared to hate it. But it holds its own, while still being that "safe" kind of clean, vaguely aquatic scent folks look for at the mall. And Pooka? Ladies don't milk metaphors in public. Although I hear good money is paid for it in Japan. The Japanese buy their metaphor milk from vending machines in train stations, I'm told. New York has been reformulated. It was a really amazingly blended vanilla orange and woods fragrance- a bit like Habit Rouge without the dirtiness. It wasn't a striking or different fragrance- just amazingly well crafted. I bought a bottle just before reformulation and have recently smelled the reformulation, albeit in a cursory way: it just doesn't smell like it used to: it's now more generic. I will buy another bottle at some point to see whether it approaches its former lovely and comforting self anywhere in its progression, but feel I will probably have to appreciate it more as a reminder of its former self than as the wonderful fragrance it once was. I wish I had bought a much bigger bottle at the time. This is just a note really for you, Nora, and for Katie to bear in mind that when smelling New York, it isn't necessarily the mythic version that you are smelling. Katie, when you describe yourself as having over-milked the train metaphor, I see a steam train with udders, and its whistle whoo-whooing each time you pull on them. It's REALLY disturbing!!! Salvador Dali mammary train nightmare scenario for sure! Thanks for the old/new New York analysis. I had tried it shortly after reading Perfumes: The Guide in 2008, curious to see what was getting Turin all fuzzed up. At the time, it reminded me of the air freshener smell in an airplane toilet cubicle, somehow generic and anti-glamor. But the intervening years have seen thousands more perfumes pass under my nostrils, so I know my perspective will have changed. Unfortunately, it sounds like New York has changed as well. You were probably right with the anti-glamor part: as much as I loved the original formulation, it was a bit the olfactory equivalent of wearing corduroy. I think that a lot of people had trouble matching up the Guide review with the actual scent (including myself), and its title suggests what it wasn't too: it was less Manhattanite than softly spoken geography teacher. But it was superbly done. Nothing gets me through an all-nighter in the lab like Goldfrapp. Knowing that she has excellent taste in perfume makes me love Alison Goldfrapp that much more! You are friends with the most fabulous people, Katie. Can't wait to try out OV! Another Goldfrapp perfume connection: I met perfumer Pierre Guillaume of Parfumerie Generale at Les Senteurs in London a few months ago, and he told me he was inspired to create Papyrus de Ciane by listening to Goldfrapp tracks "Ride a White Horse" and "Satin Chic" on his iPod "creation playlist". I will definitely have to try this one. I'm a big fan of the "is it fragrance or just you"-type of scents. Which is probably why I wear Bvlgari pour Homme pretty much 24/7. I need to branch out. Another awesome review! Hessa, given your preferences, I think you would absolutely love one of my favorite perfumes: Portrait of a Lady from Frederic Malle. It has the rose and patchouli of L'Agent Provocoteur, the sandalwood of Bois des Iles and the sweet musk of Shalimar. Plus incense. Your friend will find it at Les Senteurs or Liberty. The other one you will like is by Miller Harris and is called Fleur Oriental. It smells to me like a contemporary take on Shalimar, with incense. Oh, and also at Miller Harris, you will also adore La Fumée Arabie, a limited edition version of La Fumée that smells of amber, incense, rose and a bit of vanilla. Miller Harris has shops in Seven Dials and Notting Hill. I can't remember exactly, but my recollection is that it's on the softer side but lasts a reasonable amount of time. It's not a bombastic powerhouse.